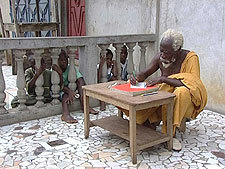 In the 1950's, Ivory Coast artist Frederic Bruly Bouabré created several hundred pictograms, based on one-syllable words in his language, Bété, to help people in the Bété community learn to read more quickly. Although some 600,000 Bétés live in the Ivory Coast, their language is not taught in schools, and all education is conducted in French. Bouabré's 400 pictograms, in various combinations, provide a playful yet tangible method of instruction, as demonstrated in BRULY BOUABRE'S ALPHABET. 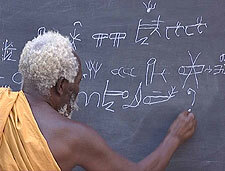 As the now elderly Bouabré explains, his aim was to "form a specific African writing from scenes of human life." Today a small number of people continue to use Bruly's alphabet, and museums around the world have exhibited his drawings. Philippe Koudjina was once a renowned portrait photographer in Niger, but now, due to injury and illness, he barely ekes out an existence, while his contemporaries Sidibe and Keita have gone on to international success.